Learn watercolor techniques to create beautiful watercolor paintings. Learn basic brush strokes, washes, glazing, masking, wax relief, wet in wet, spattering, spraying, blendind, prewetting sufaces, skies, backgrounds, foliage, ponds, lakeshores, snow, trees, leaves, clouds, mixing color and other special effects. All in this 2 hour DVD that you can use at your own pace. 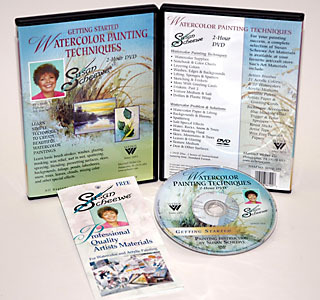 This is an invaluable tool for leaning watercolor or keeping up on your skills.